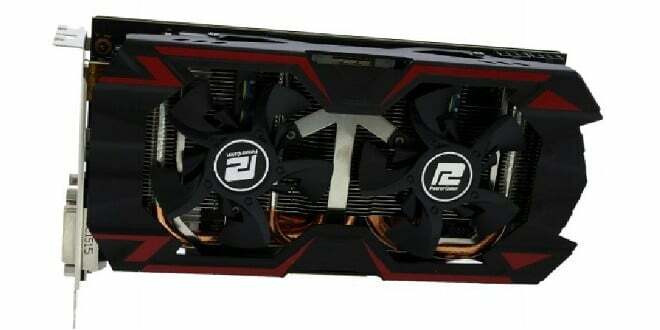 Home » Reviews & Articles » Hardware » Video Cards/Graphics Cards » AMD » PowerColor PCS+ R9 380 4GB Review (AXR9 380 4GBD5-PPDHE): The Affordable 4GB Solution. 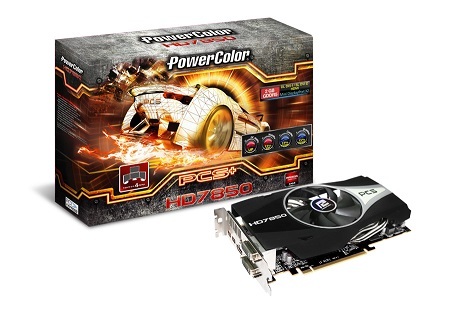 PowerColor PCS+ R9 380 4GB: The affordable 4GB Solution! We take power consumption at the wall using a Kill A Watt Power drain measurement device, I loaded Unigine Heaven and let it idle for 30 minutes recorded the Idle temperature and Power Consumption, shut it down and let it cool for a half hour then repeated the test twice in this sequence, For the load I ran Unigine Heaven looping for 30 minutes, let it cool down to the Idle temps established in the previous test then looped it 30 minutes repeating the process a total of 3 times. Once completed I take the three results from each test and average them giving me an aggregate average for each result. Killing two birds with one stone and getting Power Consumption and Thermals. Power consumption we idles at 73W and loaded we hit 271W, we highlighted the R9 290 and as you can see Idle was 6W higher and load was 43W higher. The point we are making here is the tenancy is to grab as much power and Graphics computing ability as we can, getting what you need as opposed to what you want can save you on the electric bill. For Thermal readings I looked Unigine Heaven for 30 minutes then read the thermal load, Cool the machine down for 30 minutes at an idle then read the Idle temperatures. I repeat that same process three times then average the three runs and report those scores. An eye is kept out for anomalous runs, if an anomaly occurs I shut the machine down let it cool off, reboot and rerun the test. 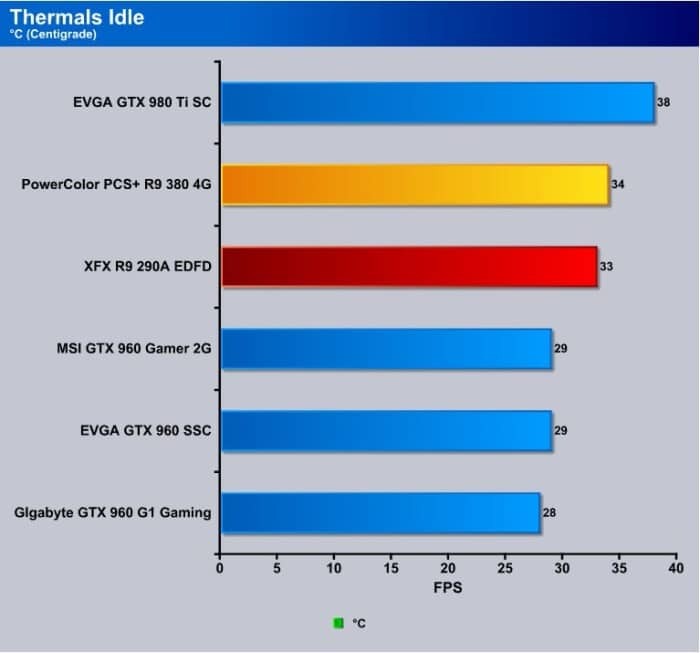 Our PowerColor PCS+ R9 380 4G idled at 34°C but keep in mind we are operating off of an open benchmark chassis which doesn’t have the ventilation a case does. 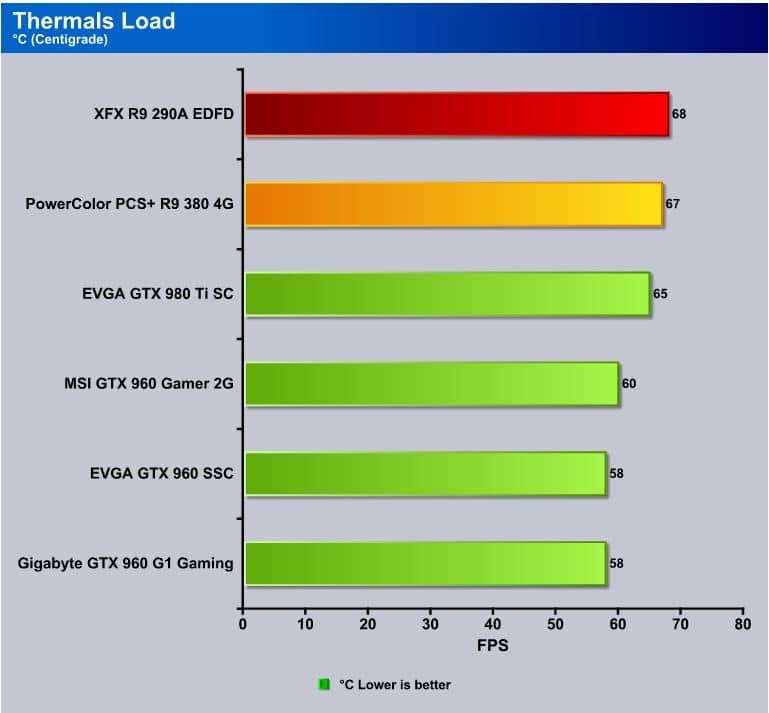 Load the PowerColor card up using Unigine Heaven for 30 minutes and we got a 67°C load temp. 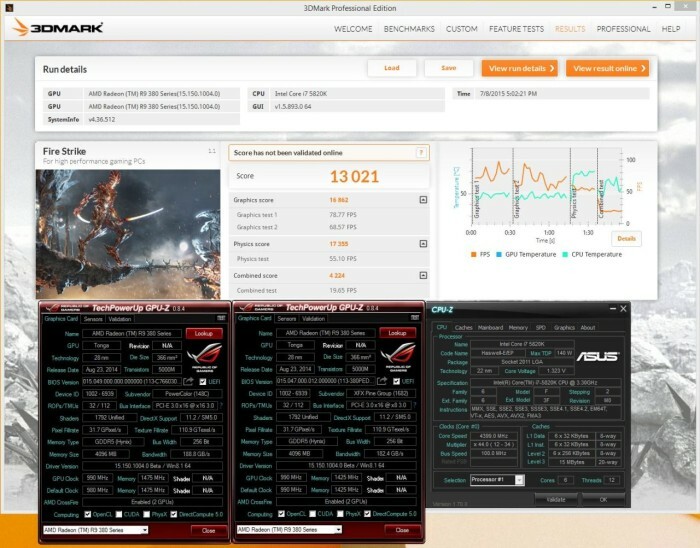 You need to remember if you are using a program like FurMark especially designed to generate heat you may get higher results but these results are typical of gaming or hard GPU load interspersed with a few dips below 100% load. Keep in mind here that we are in the Sonoran desert, AC is usually kept at 78°F and your results may vary a little but in this case usually a degree or two cooler. After 30 minutes of idle activity the Gigabyte GTX 960 G1 Gaming hit 28°C on a closed chassis with medium ventilation (CoolerMaster Silencio). We all hate noisy or whiny fans that intrude on our gaming / computing time. We run several noise level tests, Complete Idle, spiking load where the graphics load fluctuates between high and low load, and high load. We generally record sound levels sitting next to the tower with the tower at floor shelf level. We put the decibel meter close to where our ear would be and take measurements from there. To better get an idea of what the sound compares to here is a scale of typical sound levels. The PowerColor PCS+ R9 380 4G delivers on keeping things quiet, when the GPU reaches 60°C the noise level is about the same as idle and hit 32dBA Running We shut the machine down for 30 minutes then came back and turned it on, left it Idle for 30 minutes and got the Idle noise reading. Then we fired up RealBench and kept an eye on the Decibel Meter and top end noise at ear level from an open chassis test bench we got 43.5dBA. Lets just say we were happy with the noise levels and PowerColors Split fan design really delivers in cooling and sound suppression. If you run FurMark or some other un-realistic purposely heat generating program you will likely get a higher noise level but not by much, we tried a round of FurMark for a few minutes and there was no appreciable difference on short two and 3 minute runs. If you want to run FurMark for a half hour and burn up your card for no good reason don’t say you weren’t warned, Modern GPU’s are set to throttle at certain thermal levels but running deliberate heat generating programs isn’t recommended and we don’t promote that practice on Bjorn3D. 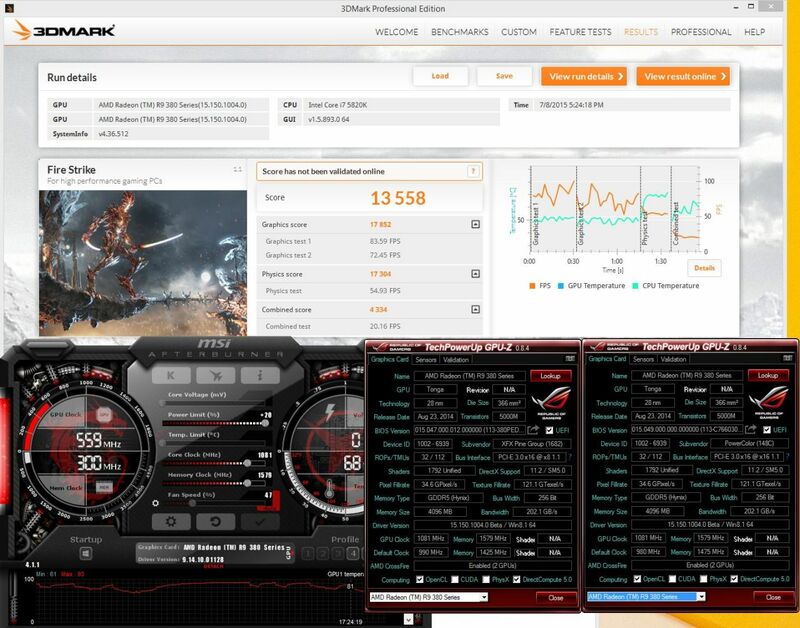 Okay we went a little different on Overclocking, we overclocked like normal, then we ran XFire with another 380 4G, then Overclocked the XFire setup and ran it on 3DMark. The results of the XFire setup are worth looking at. Here’s our GPU-Z stock settings shot showing the core at 980MHz and the Memory at 1475MHz (effective 5900MHz) and as you can see it’s an R9 380 4G and all the specifications are correct. 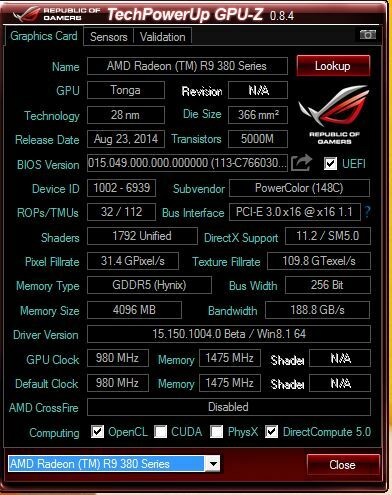 Here’s our OC GPU-Z and we got just over 100MHz core and memory, we shot the voltage up to +20 on MSI AfterBurner and could achieve higher frequencies but with extensive testing these are the settings that gave us a solid OC with no random artifacts. 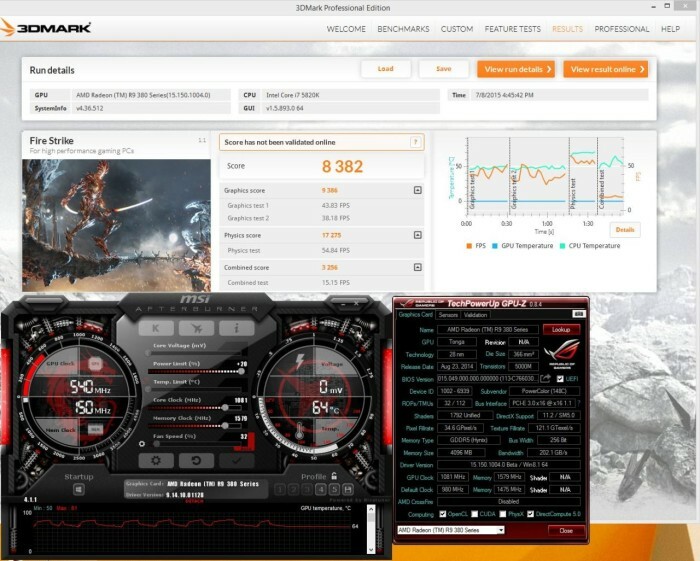 One of the easiest ways to check your OC without using a heat generating stress tester which, truth be known, is designed to make a GPU fail generating excessive heat is to simply run 3DMark FireStrike after the OC but run it at 1080, 1440 and 2160. 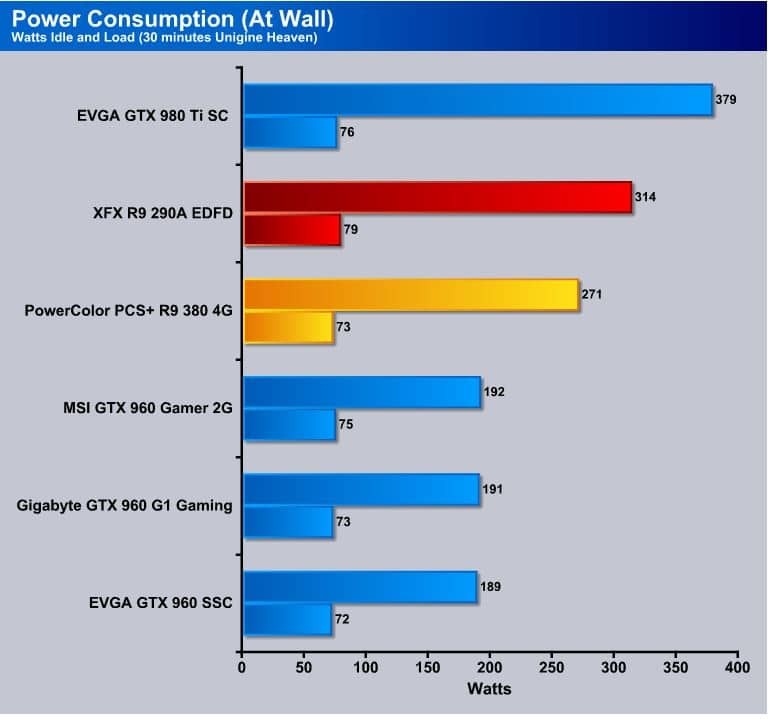 What you’ll find is that you can run a higher OC at 1080 than at 2160. Higher resolution put a greater computational strain on the GPU and if it passes 3 or 4 runs of 3DMark it’s a pretty solid overclock. We don’t stop there we run some MSI Kombuster and Unigine Heaven just for triple checking. We ran a 9386 GPU score which is what we are concerned with and that is 997 points higher than non-overclocked so we get a nice little boost. Here’s the OC chart on the PowerColor PCS+ R9 380 4G and as you can see with that OC we are a mere 135 points shy of a stock R9 290 not bad for a $229 GPU. 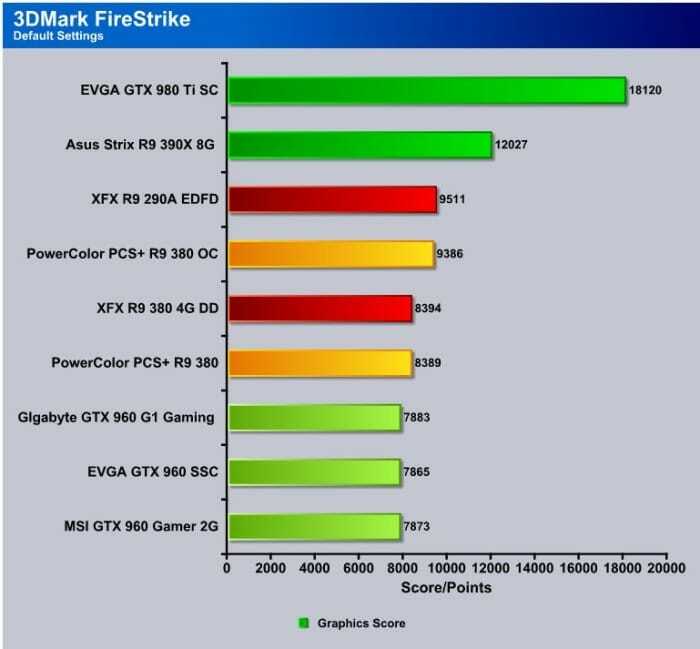 Now running our PowerColor and our XFX R9 380 4G in Xfire we hit 16862 on the Graphics score which is phenomenal for a Xfire setup on two cards costing in the neighborhood of $450. The advantage here is you can buy one now and one later spreading the cost of your investment out instead of buying one huge card and spending all that cash at once. Apply the OC to both cards and we get a Graphics score of 17852 so you can get a lot of mileage out of XFire and a little creative OCing. This review helped me pull the trigger on my purchase over the cheapest NV MSI 960 2G card for only $5 more. There’s a lot of commenters online that make it difficult for builders who haven’t bought a card in awhile, making claims that these cards run too hot and requiring a beefy PSU to be safe. The PowerColor PCS+ R9 380 4GB offers a unique look sports enough GDDR5 to game 2560 x 1440 and runs on a 256-Bit bus and does it for the same cost as a GTX 980 that runs 2 GB GDDR5 on a 128 Bit bus.